The Leavenworth Public Library will host “The Murder of Emmett Till,” a presentation and discussion by Dave Tell on Sunday, Feb. 10 at 2 p.m. in the Jahn Room at the Library, 417 Spruce Street. Presentation]. Members of the community are invited to attend the free program. The program is made possible by Humanities Kansas. 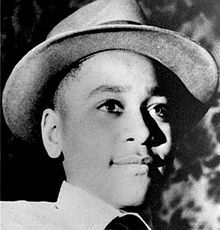 In 1955, 14-year-old Emmett Till was brutally murdered for whistling at a white woman while visiting family in Mississippi. For the next 50 years, there was not a single memorial to Till’s murder in the Mississippi Delta. Since 2005, however, over $5 million has been invested in commemmorations to the young boy. This presentation will introduce the audience to the various Till memorials and explore the competing narratives of what exactly happened on the night of the murder. Dave Tell is a professor of Communication Studies at the University of Kansas and the author of Confessional Crises and Cultural Politics in Twentieth-Century America. He is co-creator of the Emmett Till Memory Project, and his work on Till has been recognized with a fellowship from the National Endowment for the Humanities. “The Murder of Emmett Till”is part of Humanities Kansas’s Movement of Ideas Speakers Bureau, featuring presentations and workshops designed to share stories that inspire, spark conversations that inform, and generate insights that strengthen civic engagement. For more information about “The Murder of Emmett Till” presentation, contact Cindy McGuire, Programming/Marketing Coordinator at 913-682-5666 ext. 5100. About Humanities Kansas Humanities Kansas is an independent nonprofit spearheading a movement of ideas to empower the people of Kansas to strengthen their communities and our democracy. Since 1972, our pioneering programming, grants, and partnerships have documented and shared stories to spark conversations and generate insights. Together with our partners and supporters, we inspire all Kansans to draw on history, literature, ethics, and culture to enrich their lives and serve the communities and state we all proudly call home. Visit humanitieskansas.org.